Automotive repairs can be expensive, but if you have the time, patience, and a basic understanding of how things work, you can do it yourself. The DIY (do-it-yourself) movement has spread nationwide, with many car owners doing their own oil changes, installing new windshield wipers, and performing other basic services. LaCava Brothers Auto Supply & Services in Fall River, MA can help you with all the tools, parts, and fluids necessary to get the job done. Start by using our DIY toolkit tips to make sure you have all the tools for home car repair. Whether you want to perform a brake job or replace a few spark plugs, we can help you tackle some of the most common automotive maintenance. Perhaps the most common reason why more car owners don’t try to do the work themselves is that they are afraid of doing it wrong. While it is pretty difficult to ruin your car, certain repairs are more complicated than others. Start by learning all you can about home auto repair. Watch YouTube videos, read books, go through your owner’s manual, and don’t be afraid to ask for help. 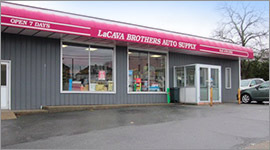 When you visit LaCava Brothers Auto Parts in Fall River, MA, we can answer any questions you might have about tools for home car repair. We have a wide variety of parts and components in stock, but whatever we don’t have, we can order. Believe it or not, cars are pretty resilient. Regardless of the make, model, and year, there are lots of basic repairs that you can start learning to save money throughout the year. The more confident you become in your knowledge and skill, the easier it will be to move on to more complicated services. If you want to learn how to do it and take control over the maintenance of your vehicle, you’ll be able to push through and absorb it all. If you need a part but aren’t sure what is required, just take a photo or bring it into our store. Our team can help you find what you need. If a repair requires a specialty tool or if a job-specific device would make the work easier, we can help you there too. Back in the day, car owners would often have to hunt around for the repair guide or manual for the specific make, model, and year just to do simple repairs. Today, you can usually download a troubleshooting guide, watch videos, and view the manufacturer’s recommendations on your home computer or smartphone. Use technology to help you get the job done right and to learn from your mistakes. Before you start making repairs to a new area of your vehicle, take a “before” picture, so you’ll know where things are supposed to be when you put it back together. Use our DIY toolkit tips to your advantage and get everything you need at our auto supply and services in Fall River, MA. Make a shopping list on your phone of all the tools you need to complete your toolkit. Some of the most fundamental tools that are required for everyday auto repair include pliers, screwdrivers, wrenches, socket and ratchet sets, and a standard jack. Many cars come with a jack for changing tires, but if you are going to be underneath your vehicle doing work, consider getting a quality jack set. Our team can help you with jacks and other tools for home car repair. Just stop by LaCava Brothers to see what we have in stock. Make sure to select tools that have a strong and sturdy grip so they will be easier to use. 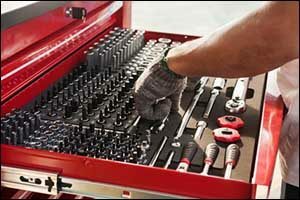 Invest in a good toolbox that will have room for all of your auto repair tools as you grow in knowledge and skill. As you get started, there are some basic auto repair tasks that you can do to build up your confidence. A dead battery is one of those start-up opportunities that you can do with basic tools for home car repair. If your car won’t start, it is either the battery or the alternator. The battery can be tested for free at LaCava Brothers. Just bring it in, and we will let you know if it can be charged or replaced. We can help you find a new battery and all of the things required to replace it at our store for auto parts in Fall River, MA. Sometimes the battery dies because a light gets left on inside the vehicle overnight, so it’s not always something that needs to be replaced. If the battery is good, but your car still won’t start, we can even help you with parts and tools to replace your alternator. Changing out the brake pads is another excellent do-it-yourself project. Speak with one of our team members for assistance in getting the right brake pads for your vehicle. Our DIY toolkit tips can help you ensure that you also have the right tools for the job. If the rotor is worn, LaCava Brothers provides rotor turning services and offers replacement parts if it needs to be replaced. Knowing when to replace brake pads is easy. There is a built-in squeal that happens when the brakes are applied. However, if the squeal gets ignored and is replaced by a grinding sound, that could mean damage to the rotors. The sooner you can replace your brake pads, the better. Call LaCava Brothers Auto Parts in Fall River, MA at 508-676-1951 or stop by our location on Bedford Street in Fall River, MA. We have served individual and commercial clients in the Greater Fall River area for over 70 years. You can trust LaCava Brothers for all of your parts, supplies, and tools for home car repair.